When I was in my late teens, I saw what I could easily have believed was a UFO full of people, were I inclined to be that sort of gullible. I was driving on a street near the West Palm Beach airport, and glanced up and to my left to see a cylindrical object with lighted windows and people flash by silently. I “knew” it couldn’t be an airplane, because the runway ran in the wrong orientation for it to have been that low at that point. 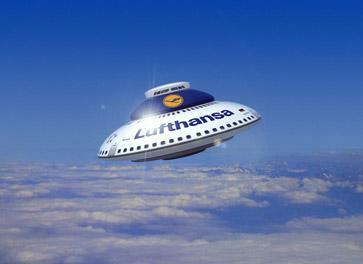 A UFO checking out the airport? No. A different runway that I didn’t know existed, and probably an airplane with the engines throttled back that I couldn’t hear because the windows were up. If I had chosen to, I could have convinced myself that there was no explanation except a UFO. Instead, as is most likely always the case with such things, there was simply an explanation that I lacked the information to appreciate. Lack of information proves nothing — except lack of information. This entry was posted in Commentary, Psychology and tagged Aviation, close encounters, Commentary, flying saucers, Psychology, ufos, Weird Stuff on December 26, 2011 by Bill. You are either the least articulate commenter in a long time, or you have no idea what the post and the other comments were actually about. Lame. I heard a story recently on the radio about a guy who called the police about having been abducted by aliens–he’d lost an hour overnight and had no other way to account for it. As you might have guessed, this occurred on the night that we switch our clocks back due to Daylight Saving time. I don’t know that I believe the story, but it’s still funny.